I picked up this Japanese card a few months ago just for the curiosity factor - I've seen some affection shown by other card bloggers for Ichiro and considering he started his pro career in Japan, he's really been one of the unique foreign born players to make a MLB impact in the past 15-20 years. 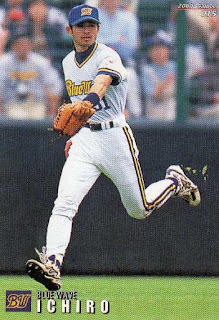 It would be nice to see Ichiro still putting up the numbers, though guy is 42-years old and his MLB playing career is on its death knell - however, he should be good to get his 3,000th hit sometime in 2016 and that eventual accomplishment will be a testament of his metronomic consistency as professional hitter. 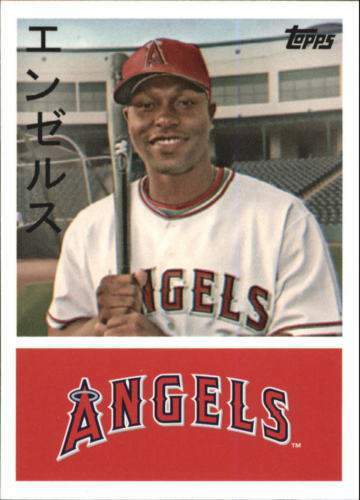 It's only a 'lousy' non-auto base card featuring the Angels top propsect, but I never really get my hands on any Bowman Sterling cards - so I picked it up since cards from the product are sort of curiosities. 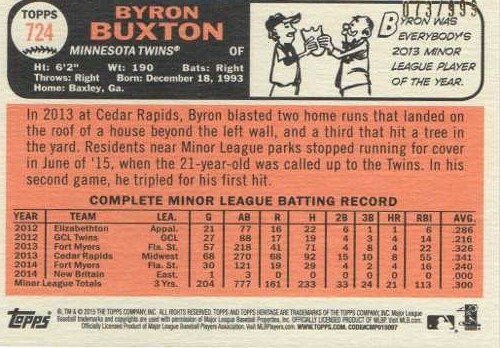 For whatever reason, I picked up a 1992 Score complete set for $6 and found this card to add to my frankenset - ideally, for the particular card number, the card I planned to pick up was a 1987 Fleer Chuck Finley rookie, though I figured to make use of the card (s) I end up with rather than being too picky. He really battled and fought on the baseball field - he had a fantastic MLB career and also starred for five years with the Angels. Maybe a gripe about Hunter was he was not always PC when it came to things like Latin players and also gays - though I doubt he is the only professional player to have those beliefs, I think writers and bloggers will always try to exploit apparent faults with 'athletes' who end up talking too much for their own good. I remember Eric Hosmer hitting 1 home run in 225 at-bats early in 2014 and wondering if he was ever going to put it together - he isn't quite in the class of great hitting first baseman, but he and his Kansas City Royals teams have clicked for the past two seasons now and look to be on a mission to win a World Series championship. I don't see the Royals as a great team made up of superstar talent, but they are a confident and fearless team that has overachieved - it will be interesting to see if the Royals' lineup can battle and compete against the New York Mets' trio of Matt Harvey, Jacob deGrom and Noah Syndergaard. I want to say that the superior Mets starting pitchers will shut down the Royals' bats - but I don't think the Royals are just going to roll over regardless of who the pitchers are on the other team. With their stud pitching staff featuring Matt Harvey, Jacob deGrom, Noah Syndergaard and Steven Matz, the Mets are primed to win the World Series - maybe the most important aspect is to get some runs on the board. 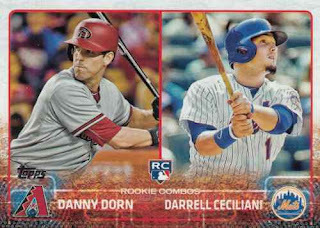 Presumably Daniel Murphy's bat is going to cool off - so the Mets need to lean on other players like Yoenis Cespedes [if playing], Curtis Granderson, David Wright, Travis D'Arnaud and maybe another guy [like a Michael Conforto or Wilmer Flores]. 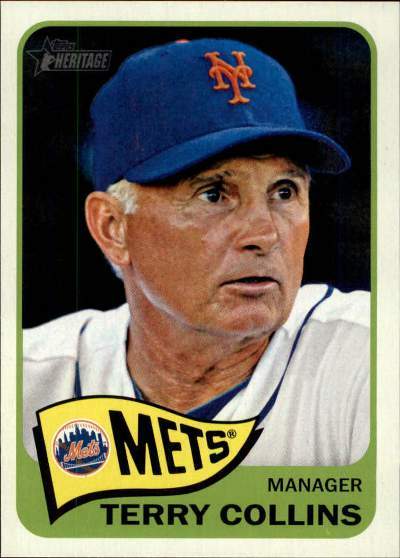 It would be nice to see the Mets win because of an individuals like manager Terry Collins and Wright - Collins has been a baseball lifer, so if he can lead the Mets to a World Series championship, he deserves all the credit he is going to get as the team's skipper. Wright has been the face of the franchise for the last 11 years - he's represented the Mets well otherwise and while he was injured for much of the 2015 season, he finally gets an opportunity to play for a championship. 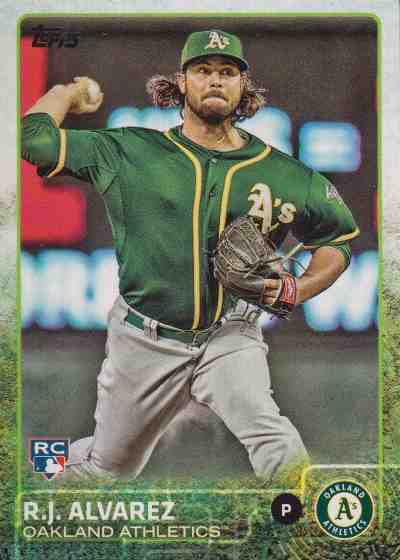 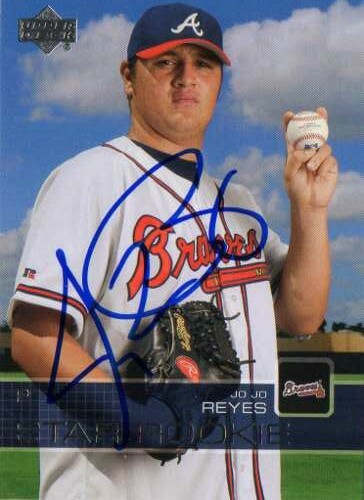 #US-261 R.J. Alvarez - a draft pick of the Angels in 2012, maybe because he never made it as a Halo and has had no MLB success otherwise, the sight of his cards haunt me. 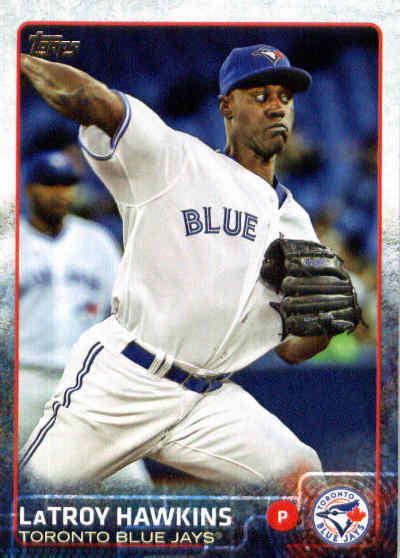 #US-361 LaTroy Hawkins - gotta give a professional ballplayer his due when he is 42 and still pitching in the big leagues. 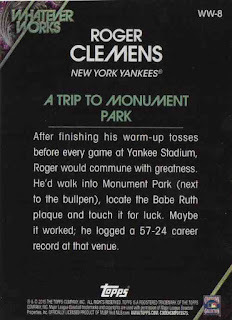 #WW-8 Roger Clemens - Whatever Works insert; I'm not sure whether or not I really like this or the Nava, but I like cards featuring quirky player trivia. 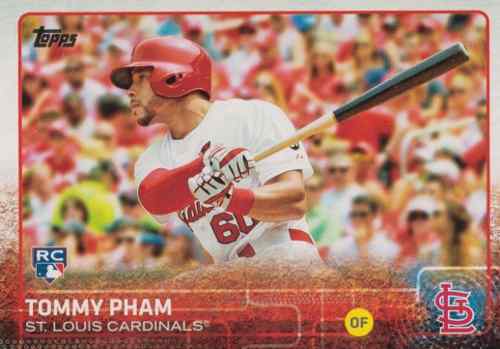 #CHA-WP Wily Peralta - Career High autograph; though I'm not guaranteed a hit out of a lone pack, this was kind of a 'meh' pull that I feel I could have found in Series I or Series II; maybe I was hoping for an All-Star and/or rookie themed card. 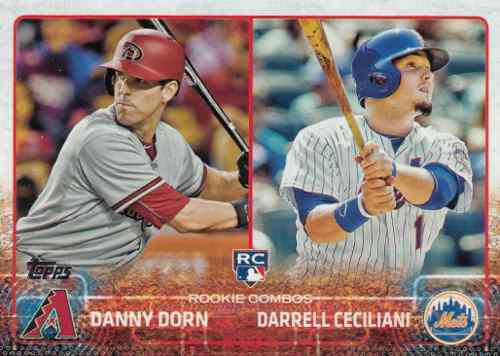 #US-256 Danny Dorn / Darrell Ceciliani - though he has to share it with another player, it must be neat for a 10-year pro like Dorn to finally show up on an MLB rookie card. 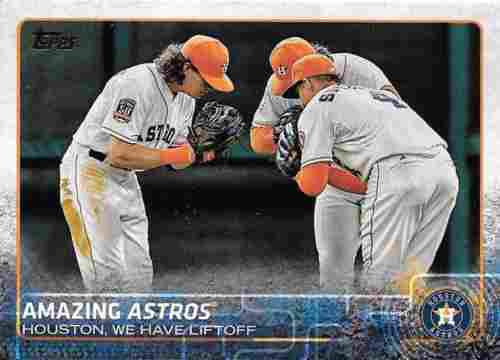 #US-156 Colby Rasmus / Jake Marisnick / George Springer - Amazing Astros; it might not mean much, though on the back of the card, it's nice Topps identified the obscured Marisnick [C] besides Rasmus [L] and Springer [R]. 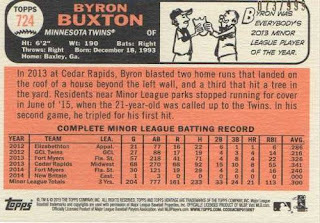 I haven't opened anything lately, so impulsively grabbed this along with an $11.99 Fairfield repack hanger box - maybe the highly regarded, yet oft injured Byron Buxton has a breakout season in 2016, but this break put me to sleep. 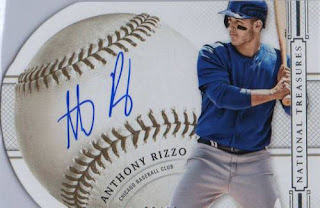 I've been on a hunt for an Anthony Rizzo certified autograph and grabbed this one for $12 - it's kind of an oddball die-cut card that isn't licensed by Major League Baseball, but at least the autograph is on-card. There are players like Reyes that end up making an appearance for major league teams every year - he was called up by the Angels in the last week of the season, pitched to one batter, recorded an out and got his first MLB win since 2011. 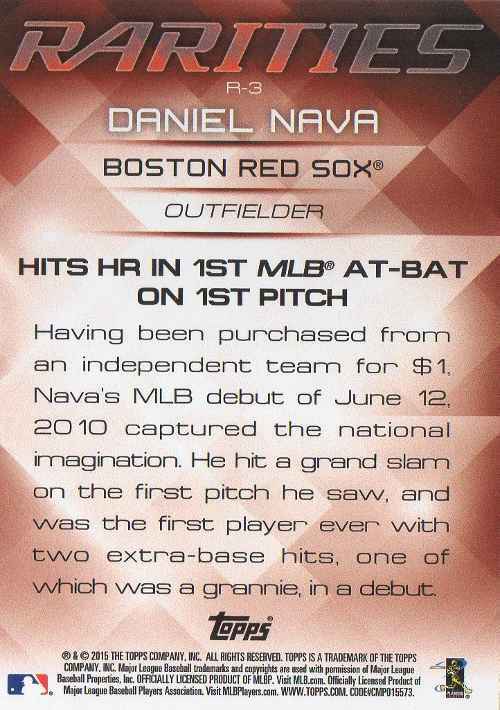 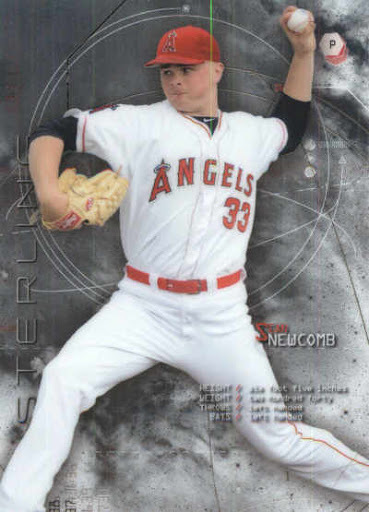 I don't know what Reyes' one-batter outing really means except the Angels were squeezed for pitching depth at the worst time so they had to call on a journeyman at AAA - it's kind of a neat to see these random guys pop up, particularly if I've gone through some of their baseball cards and are vaguely aware of who they are. 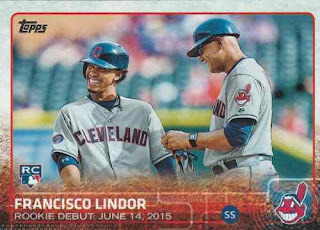 Admittedly, despite the lure of getting back to the major leagues - it might be less fun for the players themselves, when their playing opportunities are a bit dicey and they have to move around to see if they can get noticed. I'm not a fan of Leaf Trading Cards, but I paid $7 for this 2014 Leaf Trinity certified autograph card of the Angels top prospect - because I wanted a little 'something extra' with whatever Newcomb signs as his autograph. I didn't realize I had a random Topps insert card autographed, featuring Carew as a Minnesota Twins uniform - so I pick up this card for $4 since Carew was named the 1967 American League Rookie of the Year. 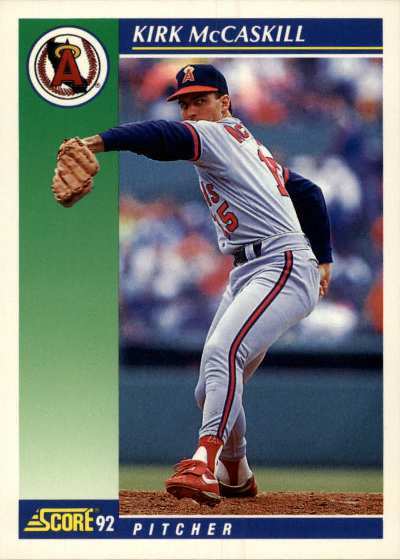 For my award winners project, I'd really like to use cards issued during a player's career [as close to his award winning year (s) if possible] - instead of a reprint or a retro card [cards issued after a player's career]. I don't really end up caring for retro cards because I feel like they just 'aren't the real thing' as far as original old-school/vintage cards - Topps has just pumped them out over the last 10 years and I feel they tend to be redundant, especially when Topps recycles images to use on cards. 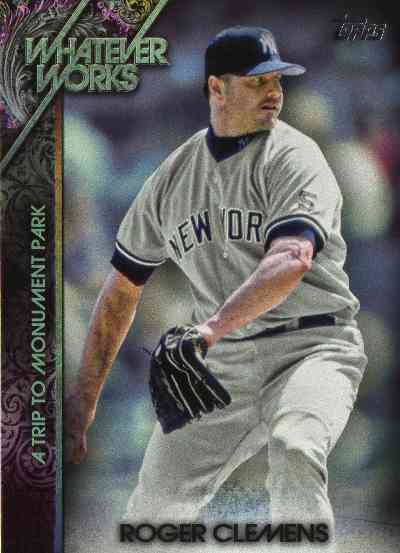 As is, retro cards are much easier to find and use for random card projects that need old-time legends / icons - at the very least, retro cards give a refreshing, if anachronistic look to showcase players from from the past. 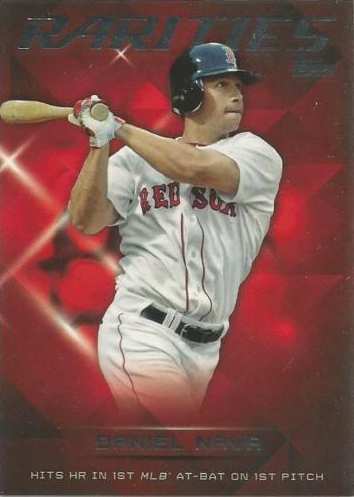 Some retro cards stand out more because they can be shiny, can feature an autograph and/or a 'game used' relic - I like how some cards specifically highlight players' award winning seasons and/or recap the players' career highlights. 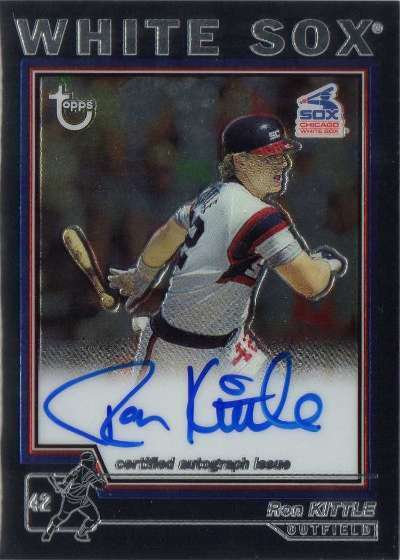 I picked up a Kittle certified autograph for my award winners collection - I think the 1983 American League Rookie of the Year signs through the mail, but it's too much work to put together an autograph request these days. In 1983, Kittle was a hot rookie with a hot card [1983 Fleer #241] but just didn't live up to whatever hype he generated in his first year - on the junk wax cards I stumbled upon around the time he played his last few seasons as a MLB player, the fact that Kittle wore glasses made me think he didn't look that part of professional athlete. Though Kittle hit only .239 and had an on-base percentage of .306 in his 10-year MLB career - he was actually serviceable, hitting 176 home runs with an an OPS + of 110. Bautista's 7th inning home run theatrics in Game 5 of the American League Division Series was another example of a player needing to be a heel to show that there is a lot at riding in the postseason - maybe Bautista's bat flip was excessive and wasn't called for, but maybe he was just relieved to come through. 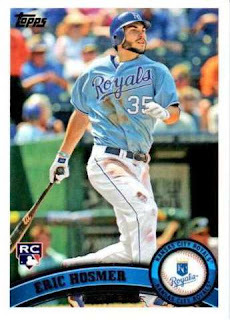 The Texas Rangers had gone up 3-2 in the top half of the 7th inning because Toronto Blue Jays catcher Russell Martin got a little lazy when throwing the ball back to the pitcher - but by hitting a 3-run shot to put his team up 6-3, Bautista was able to let out all his frustrations, effectively saying to his teammates and the Blue Jays fans know that their team wasn't about to go out like some punk itch. 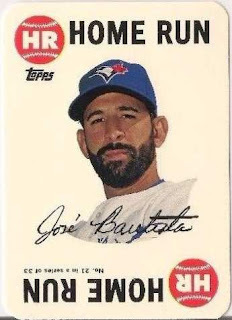 Now Bautista and his team move on to the face the Kansas City Royals in the American League Championship Series - while Josh Hamilton and the Rangers can go into the off-season and do their thing, even if Hamilton is doing so on Angels owner Arte Moreno's dime. 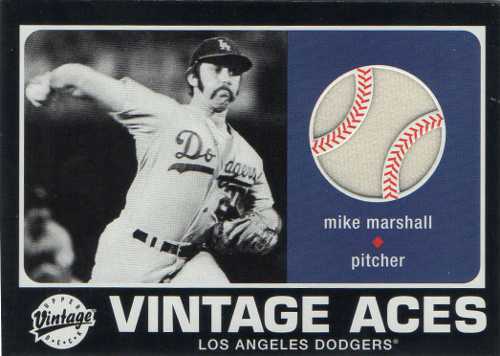 This $2 pick up represents an oddball find for my award winners collection - a 14-year old card with some sort of game used material, featuring a workhorse reliever who won the 1974 National League MVP. 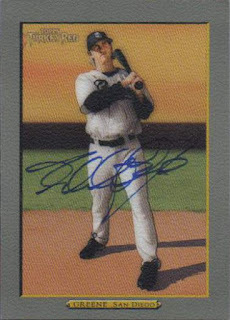 I figured this card was the best I could do to represent Marshall as getting an autograph is kind of out of the question - due to personal his beliefs about not putting people like pro athletes on a pedestal, Marshall charges at least $250 for each autograph when a promoter can get him to do some sort of private signing. A wrinkle to my project is to sometimes have a couple of cards to represent some players as a 'micro-mini' collection - maybe I'll seek out one of Marshall's old-school Topps cards [1975 Topps #330 or the highlights subset #6] to pair up with this relic card. I have tried to get as many 2005-2006 Topps Turkey Red cards autographed in-person/TTM to varying degrees of success - I spotted the Greene TPA signed card, when looking through certified autographs of players who remain curiosities for whatever reason. I thought I originally saw the autograph card for closer to $2, but when I looked for it again, the listed price had gone up to about $5 or so - I finally relented to pick up the card up when I saw the price bumped back down. 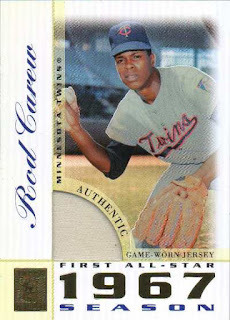 With the potential to be a good all-around shortstop with power and a surfer boy look that probably played up to the home team crowd - Greene had the makings of a fan favorite with the San Diego Padres. Greene however, turned out to be a notorious recluse and for him, the struggle was indeed real - as a MLB player, he was apparently beating himself up and was more consumed by failure than success. 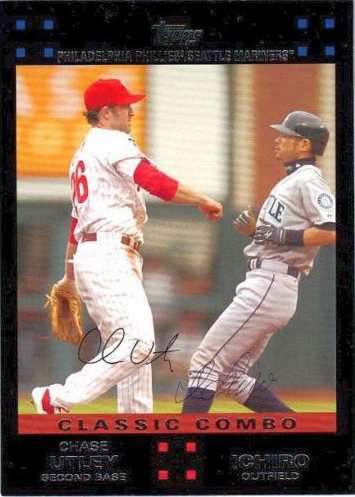 I've only really watched bits and pieces of the MLB postseason, but what Chase Utley did to end Ruben Tejada's season perked up my interest - I didn't want to see Tejada getting hurt on an apparent takeout slide, but when it counts, fans needs to see some of these players act like heels to show that there is something at stake. Utley hit .202 in 141 at-bats for the Dodgers after being acquired from the Philadelphia Phillies - but his unforgiving slide Saturday night is where the intangibles from a longtime veteran who has done it all come into play. 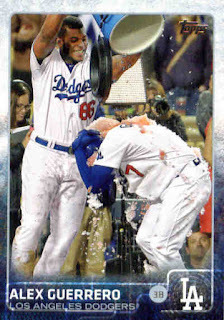 Suspending Utley for two games was the right thing to do and at some point, the New York Mets should back up their fallen player - but more power to the Los Angeles Dodgers if Utley's slide is the turning point in this series and they get past the Mets. 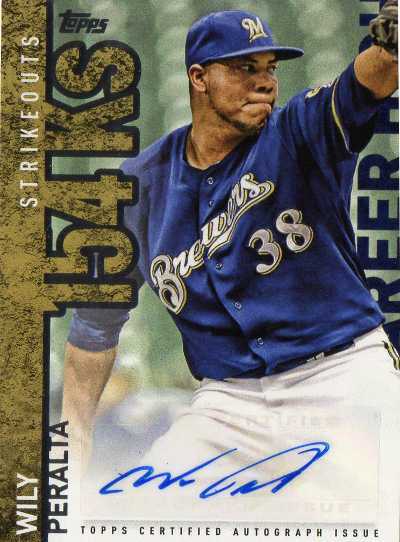 I have a binder of 'award winners' where I've tried to add cards featuring the recipients of the three big MLB awards [Most Valuable Player, Cy Young and Rookie of the Year] - about a few weeks ago, I was inspired to go through the binder to see which years were still missing and see where I could weed out cards used that didn't picture the players on the teams they won the award with. 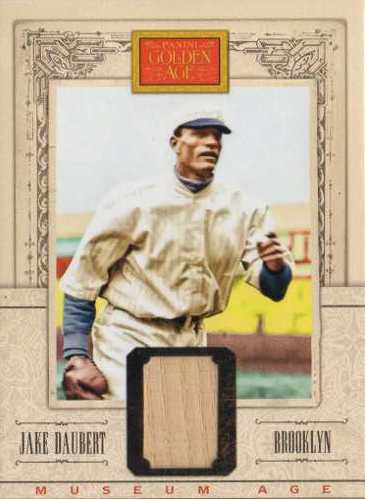 I didn't know where I could find a card of his, so I did some searching and found out he actually had a relic card - who really knows whether or not Daubert held, used, or slept with the bat that was chopped up to help create the card, but I thought it was just great to pick up the card for around $5. 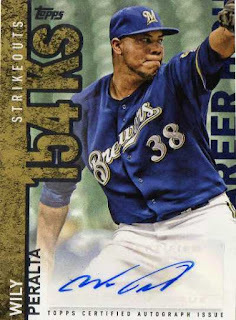 The card projects that seem the most fun are the ones where I can grab seemingly random cards and put them together - this particular project isn't a high dollar endeavor by any means, so various card types are going to clash between simple base cards, random uncertified autograph cards, memorabilia / certified autograph cards and player era / retro cards. 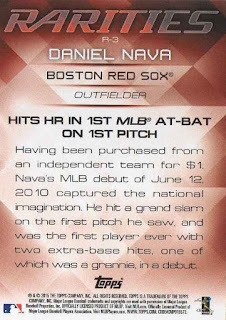 Though I haven't kept up with most baseball releases, I picked up a 2015 Topps Heritage High hand-collated 200-card non-SP set as a tease - there may not be the cheap thrills gained by pulling assorted inserts and short prints in blaster and/or loose pack breaks, but at least I can go through all the regular cards in the set. 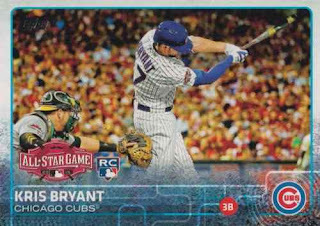 MLB/MLBPA rookie logo cards of Kris Bryant, Francisco Lindor, Carlos Rodon, Jung Ho Kang, Addison Russell and Byron Buxton are in the short print set - so I'll figure out if I want to seek those guys' cards out as singles or go through some blaster and/or loose pack breaks. 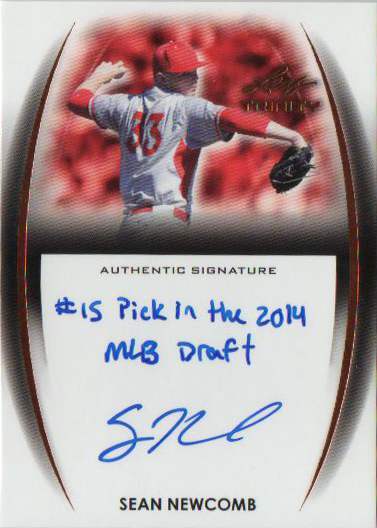 While I've probably pulled his cards from various draft / prospect products over the last several years - this Carlos Correa MLB / MLBPA rookie logo card is a keeper. 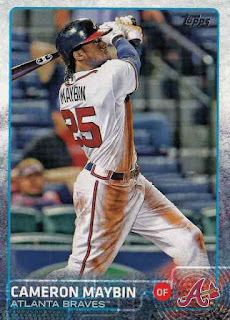 It's a fun story to have a player named 'Odubel' come out of nowhere to have mostly a fine rookie year with the Philadelphia Phillies - with all the success he has had, it remains to be seen if he can build upon his success or be exposed in 2016. 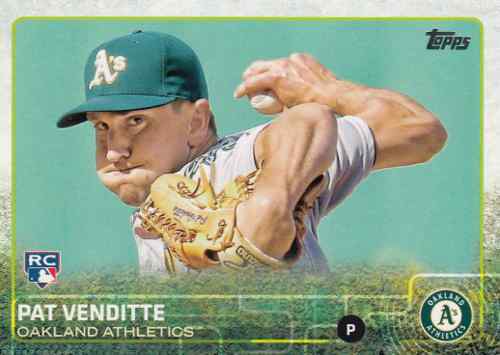 Venditte is a journeyman otherwise who doesn't really look the part of a Major League pitcher - though because he can throw with both hands, his story takes a life on its own.